Senators reconvened Jan. 6 to introduce new bills. 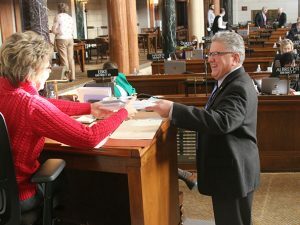 Sen. Mark Kolterman submits a new bill. LB129, sponsored by Lincoln Sen. Adam Morfeld, which would increase the earned income tax credit. The session will last 90 legislative days and is tentatively scheduled to adjourn June 2.